Recently, I wrote about how excited I was to be one of the first teachers to see the TADPOLE Kit for infants and toddlers who have a visual impairment. As I said in Part 1, the kit is amazing and helps educators to see what is truly being seen or not seen, understood or not by the little one. I was also excited when I took the kit to a daycare to assess one of my toddlers who lost her vision through Shaken Baby Syndrome. Although the baby has physical and emotional trauma from the event, she is beginning to make progress and is even tracking the blue light from the TOAD Kit (that’s my next article). It was wonderful to be able to carry a case that was, along with the items for testing, light in weight and easy to carry. With my black blanket, and items such as the banana puzzle, a real banana, and the large puzzle book, I began to notice that my student was actually using her right central visual field. The baby turned her head using “eccentric” vision and look from the black and yellow picture of the banana to the real banana that was placed in front of the black blanket. Because she has cvi, my student can see objects easier with the dark blanket available from the TOAD Kit. I opened the large puzzle book and held a large print picture of a woman in front of her while I wore the black apron. She once again went directly to her right central field of vision and smiled. Although she struggles with hand-to-eye coordination, the baby was showing an interest visually and slightly began to move her hand toward the banana puzzle. Some activities that my student and I did with the real banana, and the one from the puzzle was to sing, “Banana split! Go bananas, go, go, bananas, go bananas, go, go, bananas.” She moved her head to the beat to my unfortunate lack of talent but seem to enjoy the finger play. As we sang, I continued to allow her to smell the banana and look at the puzzle version. 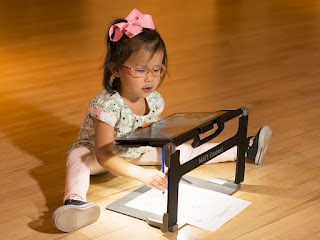 It is crucial for children especially ones with a visual impairment, to have someone draw attention from the real object to the representative one. Since Javier is behind verbally I took the blue cup from the cup and began echoing sound which he thoroughly enjoyed and began to copy. He also began to match the colored bowls with the colored balls and began throwing them across the room. Educators need to realize that throwing and mouthing items is a part of learning and exploring the world. Thanks to kits like the TOAD and TADPOLE from APH, educators and parents will witness visual strengths and weaknesses and apply fun activities with the items in this awesome kit.